The crowd sourced exhibit will debut Oct. 17. OLD TOWN — After putting out a call for exhibit ideas two years ago, the Chicago History Museum is getting ready to reveal its first-ever crowd sourced exhibit. The exhibit, dubbed "Chicago Authored," revolving around the city's authors — past and present — will open Oct. 17, according to a news release. Its creators, folks with the museum and a historian will be on hand at 10 a.m. to talk more about the exhibit. Tickets cost $10 for the general public, but are free for museum members who make a reservation. The exhibit is the result of the Chicago History Bowl project, which is the first effort of its kind in the country to allow the public to choose an exhibit at a museum. About 550 Chicago residents accepted the challenge. Ultimately, the city's authors came out on top, beating prohibition, architecture, the great Chicago fire and notable women of Chicago. At the winning exhibit, there will be two full-length multimedia programs, a postcard-writing activity and a magnetic poetry wall. There will also be bookshelves filled with books, including classics from Nelson Algren and Gwendolyn Brooks alongside modern works by Malcolm London and Audrey Petty. An audio tour will let museum-goers explore the works of Chicago writers through four perspectives: a view from a window, through an open door, into a keyhole and reflected in a mirror. 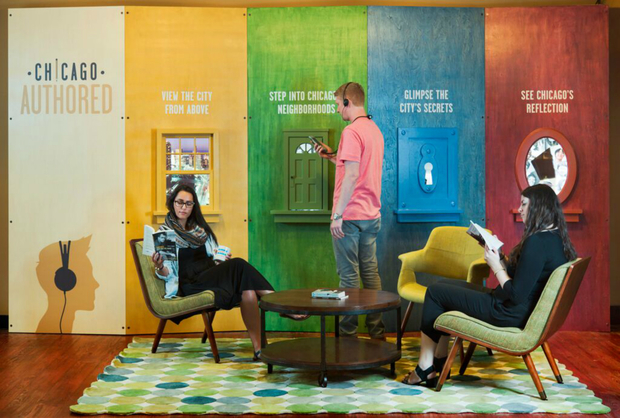 After visiting the crowd sourced exhibit, visitors are encouraged to check out the museum's permanent exhibit "Chicago: Crossroads of America," where you can listen to works by a dozen local authors like Theodore Dreiser, Lorraine Hansberry and Studs Terkel. The exhibits and audio tours are free with general admission, which is $14 for adults, $12 for seniors and students and free for children under 12.